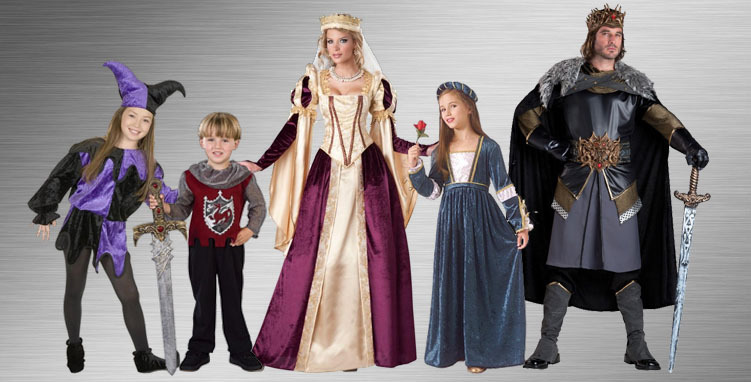 From stalwart knights who defend the land to pretty princess who love to wear big, billowing dresses, these Renaissance Costumes help you find the perfect look for your next Halloween! Whether you're going out for some trick-or-treating or will arrive at a costume party in style, this collection has everything you need! Now “going medieval” can be more than just a threat from a bad guy in a movie! 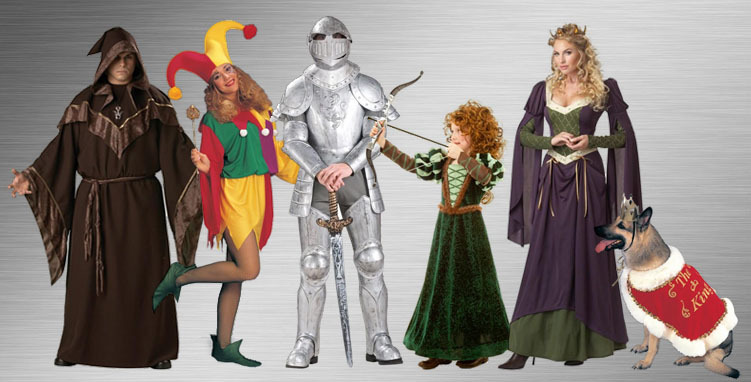 You can literally go medieval with our vast selection of Renaissance and medieval costumes and accessories. We’ve got the Noble Knight costume, featuring a red tunic with coat of arms. You can choose from a variety of dresses and gowns for the fair maiden. If being a sorcerer with a full-length robe and hood is more your style, we’ve got that, too. You could be a court jester, the stand-up comic of yore, but don’t forget the must-have pointy shoes. Then there’s our women’s Musketeer costume (otherwise known as the 4th Musketeer). Complete the look with a sword, scepter or shield. Dost thou care to be a knight of the round table or a monk? A fortune teller or a forest princess? Ere you go to a Renaissance fair, a medieval-themed restaurant or a Game of Thrones party, grab a costume that looks so real they’ll think you're a time traveler. Just be sure to hide your cellphone! And don’t forget the king of the house, the master of the realm, your four-legged best friend. Huzzah! Robin Hood was an archer who was skilled in the use of bow and arrow. He traveled with his posse, the band of Merry Men, and was known for robbing from the rich to give to the poor. He’s become a folk hero and the subject of many a movie. Are you brave enough to be a man in tights? A rather odd-looking bunch known for their weird hats and pointy shoes, court jesters were historical entertainers often employed to entertain a ruler or other nobility in medieval or Tudor times. They were also performers who entertained common folk at fairs and markets. Surely you jest. Nay! A knight would be expected to guard the castle and support his liege lord in Middle-Ages warfare. Dare to be a dark knight, or a knight from Monty Python and the Holy Grail. A knight has the coolest chess move on the board, too, and you can be just as cool in one of our knight costumes. Not to be confused with a plain ol’ maid, a maiden was a young unmarried woman during medieval and Renaissance times. Think Maid Marian, Robin Hood’s love interest of noble degree. Great hair, long flowing gowns in jewel tones, lace-up bodices, maybe an attitude…what’s not to love? The three vows of poverty, chastity and obedience ruled St. Benedict and the life of the medieval monks. Their hair was shaved except for a narrow strip round the head. Think Friar Tuck, one of Robin Hood’s Merry Men. Monks just wanna have fun. The Man in the Iron Mask. The Three Musketeers. Everyone loves a musketeer movie. A musketeer is more than just a guy with great boots and a feather in his hat. He was a heroic and loyal soldier equipped with a musket, and he apparently preferred traveling in groups. It’s all about the magic. Wizards have been known to accessorize their wardrobe with crystal balls, wands, staves, books, potions, scrolls or tinkling bells. The term sorcerer is more frequently used when the magician in question is evil. Add an air of mystery and unleash your hidden mystical powers. There are nice queens and not-so-nice queens. They have one thing in common, though, and that is that they like to be in charge. They also look good doing it. From Cersei in Game of Thrones to the Evil Queen in Snow White, queens are iconic characters who are respected and sometimes evil. Long live the queen! The Royal Court has many characters, such as the king, queen, prince, princess and, of course, the court jester. The days of medieval and Renaissance kingdoms and all the drama that went with them have become a popular topic in movies and television. If you're fascinated with the period or wish you had lived back then, you can hold court in fantastical costumes of such authenticity that folks will be bowing before ye. The whole family can dress to the nines and accessorize to the tens. Every little girl wants to be a princess, so make her dreams come true. The little prince will pick up a sword and shield to protect the realm. The king commands attention in a cape and crown. The queen rules over the kingdom with style and grace, and maybe some flirty fun. If you’re brave enough, entertain everyone as the court jester, the most flamboyant of the bunch. With his iconic pointy hat and curled-up shoes, the crowd will be entertained. Oh, and don’t forget the most important accessory for men and women: tights! 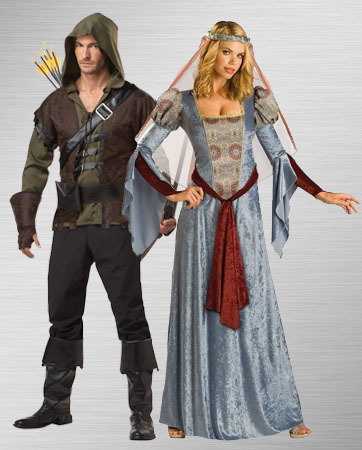 Whether it’s Halloween, a Renaissance festival or a Game of Thrones party, your royal wardrobe awaits. Your kingdom for a horse. Or a song. 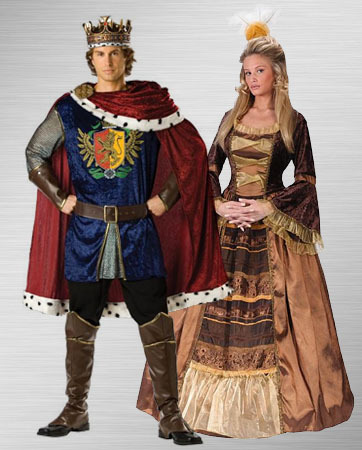 Be king of your realm or queen for a day with authentic attire from medieval and Renaissance times. Don’t forget accessories like velvet capes, jeweled crowns and scepters. The two of you can dress the part of the royal couple and hold court at the party all night long. Robin Hood is a heroic outlaw in English folklore known for being a highly skilled archer. He is often portrayed as one who "robs from the rich and gives to the poor" alongside his band of "Merry Men." He wore a feather cap and green tights and hung out in Sherwood Forest. He also had the hots for Maid Marian. A suit of armor suits him. Every little guy wants to be the knight whose duty it is to protect the realm. Or just dress like it. Either way, the shield and sword are necessary. With them, he can protect Renaissance mom from the evil drudgery of cooking and cleaning. White horse optional. Funny weird or funny ha-ha? Either way, entertain them in style with our adorable Jester costume. Add some point jester shoes to complete the look. 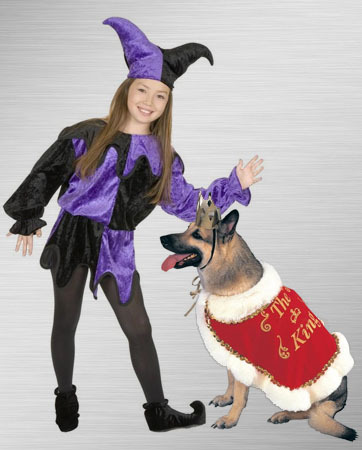 Your pooch probably rules the kingdom anyway, so why not get him a King costume with cape and crown? The clothing of kings has always been primarily about outwardly displaying wealth. The wealthier a king could make himself seem to allies and enemies, the more feared and respected he was. 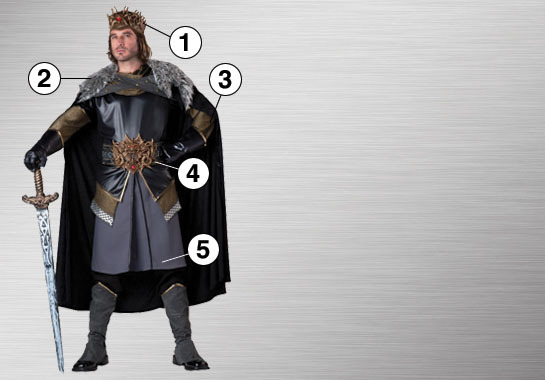 Earn some respect and show your royal status in style with our ultimate costume, the Medieval King. It comes with a brass-color crown with ruby accents, faux fur overlay, faux chainmail collar and sleeves, ornate belt and a purple-gray tunic. The color purple was considered especially regal. All you need to add are the sword and boots. This costume is so authentic that folks will be calling you Henry. Bring out your child’s confidence when she dresses as the strong and brave warrior Snow White from the Snow White and the Huntsman movie. 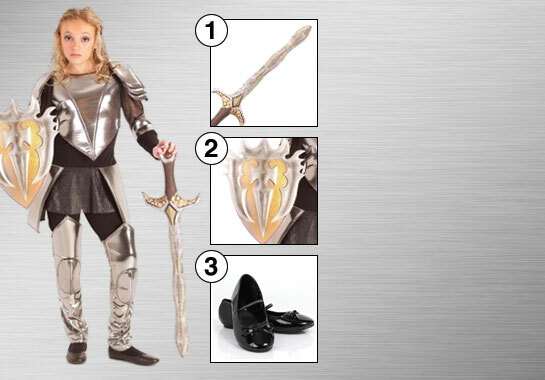 The Warrior Snow Costume includes black tight pants with silver leg armor and a matching black shirt with a shiny silver breastplate. There’s also silver armor on the shoulders and arms. To finish off the look and make her a real warrior, add the matching warrior shield and sword. And don’t forget the black shoes to coordinate with the suit. 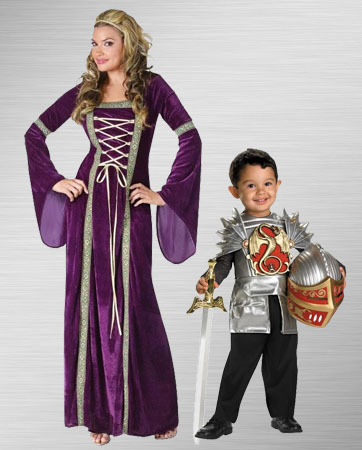 With this costume you daughter will be ready to take on whatever adventures the day may bring.